While I love oatmeal, it's not particularly practical to take a bowl of oatmeal with me to the gym. Instead, I make baked oatmeal, which is portable, doesn't need to be heated and I can make in advanced for the week. My favorite version is peanut butter baked oatmeal, I had a few leftover fruits that I wanted to bake into this week's oatmeal. 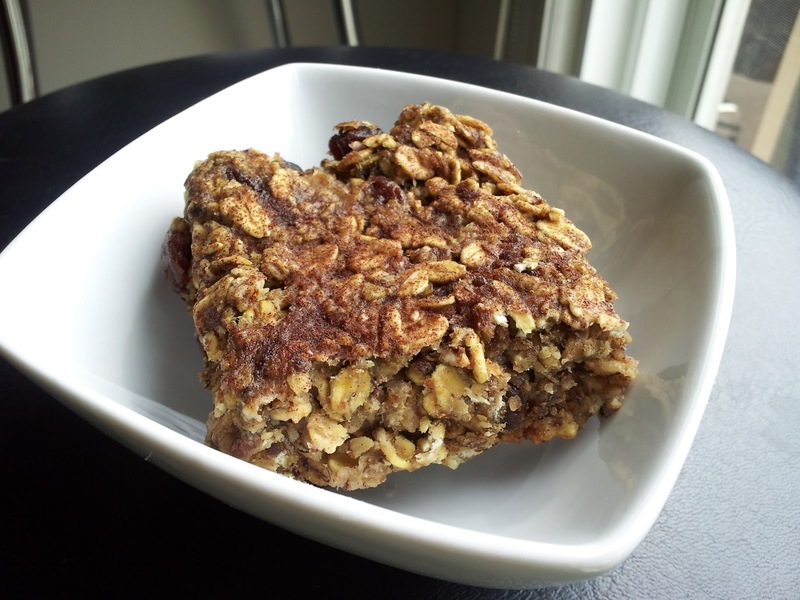 Mix the oats, Splenda, flax, baking soda, cinnamon and raisins. In a separate bowl, whisk the egg whites, then add the banana and applesauce. Add the wet ingredients into the dry ingredients, then mix. Pour into an oiled 8x8 pan and bake in a 350-degree oven for 20-30 minutes or until golden brown. Looks awesome! I, however, have not been at all motivated in the kitchen since I have allowed my old friends, swim & bike, back into my life. I am even guilty of allowing processed foods & "delivery" back into the kitchen. Please shoot me.